Looking For A New Holiday Family Tradition? Join Virginia Limousine Association Presenting The Tide Water Tinsel Tour this year! Round up your family, friends and loved ones and enjoy a festive ride through the neighborhood in a luxurious limousine! What better way to capture the holiday fun than in a large limo where you can sit back and marvel at the Christmas lights? 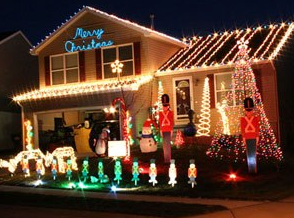 It's always a time for happiness and cheer on our ventures through local neighborhoods with stunning light displays. Start A New Family Tradition With Us! Virginia Limousine Association Presenting The Tide Water Tinsel Tour stops at several houses and commercial sites in Virginia Beach, including Holiday Lights at the Beach, the drive-through display on the Boardwalk; 43rd Street at the Oceanfront; Wimbledon on the Bay off Great Neck Road; Lakeview Park; Founders Inn; and Brigadoon. This three-hour long guided ride is sure to bring joy to your Christmas season this year! Prices usually range between $190 and $500 depending on the vehicle and passengers. And we are always looking for new beautiful neighborhoods to add to our journey!